When a beloved pet dies, you experience the loss deep in your soul. You feel alone in an uncaring world that doesn't understand your special grief. You long for one more touch of doggie fur or the sound of your cat's contented purring. You wonder if things will ever be the same. 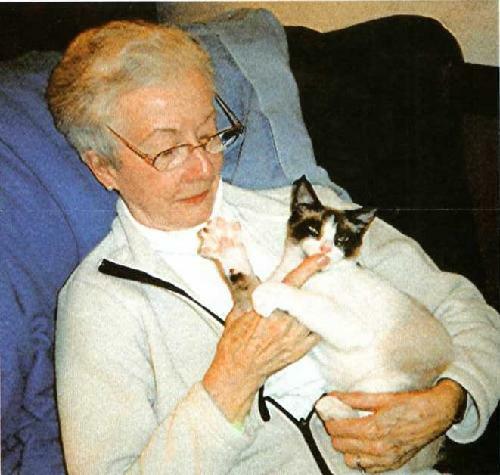 Charley warmed her way into a home where a cherished cat of 15 years had passed away. Overwhelmed by grief, the family vowed, "No more kitties." The sadness was too painful to go through again. Eventually, the family succumbed to the emptiness in their hearts and the need to save another orphan. At our shelter, "Charley Price" introduced herself to the visitors. There were many kitties in the room, but she stood out for her charming ways.